By Audrey Golden. Mar 18, 2016. 9:00 AM. Bohumil Hrabal was a Czech novelist and essayist whose work perhaps best depicts the tragicomedies of politics and everyday life. He was born in Brno, the second-largest city in the Czech Republic (after Prague), on March 28, 1914. At the time of Hrabal’s birth, however, Brno was one of many Eastern European cities within the Austro-Hungarian empire. And during Hrabal’s lifetime, he’d see those national borders that defined his urban life continue to shift as both Brno and Prague became part of Czechoslovakia (1918-1993) and later the Czech Republic. His fiction has been adapted for the screen on more than one occasion to much critical praise, and if you have a chance, you shouldn’t hesitate to start reading his work, which redefines the boundaries of magical realism at several significant moments in twentieth-century history. Closely Watched Trains, or Closely Observed Trains as it’s commonly translated in British publications, is probably Hrabal’s most famous text. He wrote the novella in 1965, but the text looks back to the German occupation of Czechoslovakia during World War II. It tells the farcical story of Miloš Hrma, a young railway station guard, who deals absurdly with Nazi collaboration, bureaucratic rubberstamping, and totalitarian resistance. The text was adapted into a film a year later by the famous Czech New Wave director Jiří Menzel, and it won the Best Foreign Language Oscar at the Academy Awards in 1968. A few years later, Hrabal returned again to World War II-era Prague. His novel I Served the King of England [Obsluhoval jsem anglického krále] (1971) traces the experiences of Ditě, a Czech hotel employee who dreams of one day being as important as his mentor, a maître d’ at the Hotel Paříž in Nazi-occupied Prague, who once-upon-a-time served the King of England. Not unlike Closely Watched Trains, the novel farcically depicts Ditě’s encounters with German occupiers and sympathizers during a period of stark violence in Europe. More than 40 years after directing the film Closely Watched Trains, Jiří Menzel returned to direct the cinema adaptation of I Served the King of England (2008). No, this isn’t another title of one of Hrabal’s works. 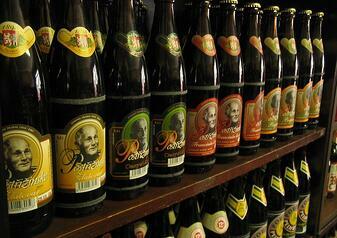 Rather, it’s the name of the famous pub on Husova Street in Prague where Hrabal would sit and write his fiction. But it’s not just famous because Hrabal alone sat in the booths. Indeed, the pub turned into a significant meeting place between Hrabal and political figures from across the globe. For instance, in 1994—only three years before his death—Hrabal met then-president Bill Clinton, U.S. ambassador to the U.N. Madeleine Albright, and then-Czech president Václav Havel in his favorite watering hole. When we stopped into U zlatého tygra a handful of years ago, we asked the bartender on duty where Hrabal’s booth was located. He kindly pointed us to the spot where the writer used to sit and even let us take home a few coasters from the pub. We didn’t, however, see any sign of Hrabal’s ghost. In some cases, the phrase “life imitates art” appears to ring true. In 1997, newspapers reported that Hrabal died after falling from a Czech hospital window while attempting to feed pigeons. The seemingly farcical nature of his death speaks to the characters and narratives he developed during his lifetime, emphasizing that life is funny, absurd, and ultimately brief. 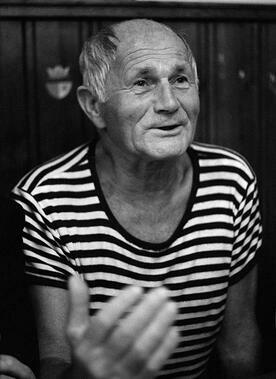 Why should you read the work of Bohumil Hrabal? We can’t think of another writer who has so deftly contended with the inherent absurdity of modern existence in ways that still manage to showcase love, humor, and beauty. In honor of Hrabal’s birthday month, seek out one of his works of fiction to add to your collection. *Image sources here and here.